How does a 1.5 mile walk through a lava tube in pitch black sound? Well, you can take that walk as well as explore more lava-related features on the south side of Mount St. Helens (an active volcano that last erupted in 1980) where there are three National Volcanic Monument attractions to explore: Ape Cave, Lahar Viewpoint, and Lava Canyon. 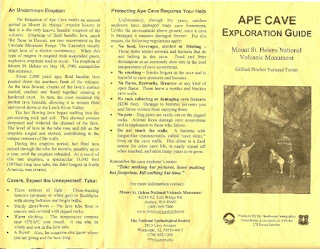 Ape Cave is the lava tube. 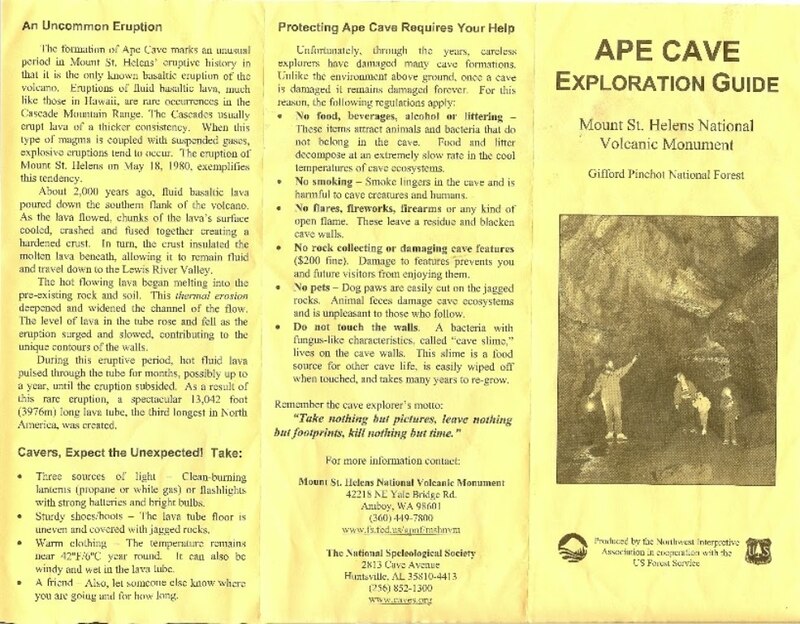 Ape Cave is a lava tube formed during an eruption of Mount St. Helens 1,900 years ago. The lava tube is 2.25 miles long and drops a few hundred feet along its length. The main entrance to the tube is at 0.75 miles up from the lower end of the tube. 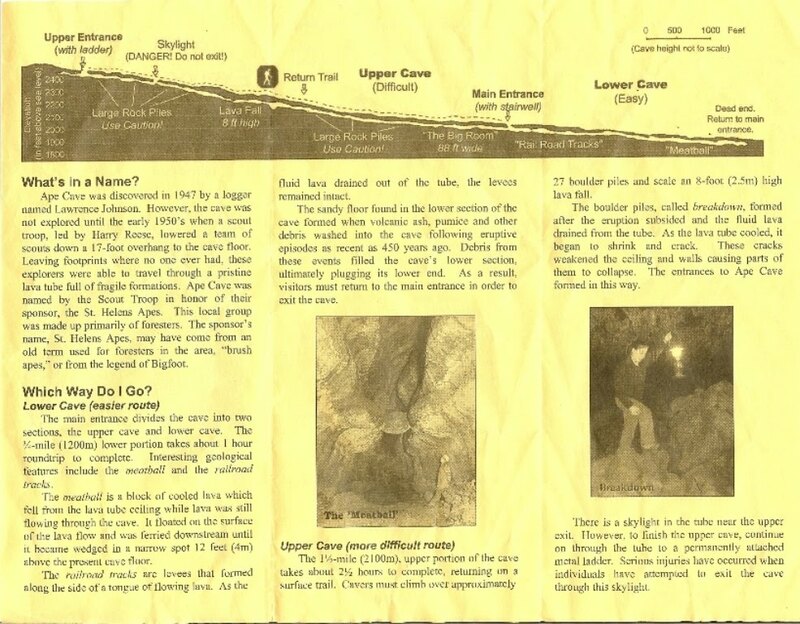 From the main entrance you can follow the upper cave for 1.5 miles or the lower cave for 0.75 miles. We walked up through the upper cave and came out at the upper entrance. During the hike there were a couple of difficult spots (like an 8 foot high lava fall) that were tricky to get up but doable if you are in reasonable shape. After exiting at the upper entrance you can follow an easy above-ground trail back to the main entrance. Plan ahead and bring the appropriate gear for exploring the cave such as the right clothes and flashlights. You can rent lamps at Apes' Headquarters in the parking lot for Ape Cave, but check to make sure it (the headquarters) is open on the day you plan to visit. Continuing from the Lahar Viewpoint on you reach Lava Canyon. There is one main trail, 184, and several loop variations. The main trail follows the Muddy River downstream and is not particularly dangerous but is definitely not for those who don’t like obstacles (40 ft ladder down a cliff) or when the trail narrows and has moderate drop offs. The cool suspension bridge is not too far from the start of trail and you could walk down one side of the river, go over the bridge, and come back on the other side for a short, easy walk. In Lava Canyon you can see 25 million year old lava (tan and purpled colored) and 2,500 year old lava (dark-gray) along with different cooling patterns in lava. The 1980 lahar on this side of Mount St. Helens raced through and scoured Lava Canyon. You can still see many fallen trees.